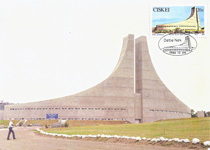 The memorial Ntaba KaNdoda National Monument was opened on 14 August 1981 in the vicinity of the South African township Dimbaza by the territorial authority of the Ciskei. Its name is derived from the Khoi-Chief Ndoda, said to have lived here in the 18th century and was killed by the Xhosa. His wife later gave the land controlled by him to the Xhosa. The memorial was created with the aim of remembering those Xhosa chiefs who died in the clashes with the white colonisers in conflicts for land tenure. At least R 860 000 is said to have been spent for the construction of the Ntaba KaNdoda National Monument by the Ciskei 'homeland government'. The contractors were LTA company headed by government officials. The building was primarily a facility for conferences and events. An open-air arena provided seating for 18 000. 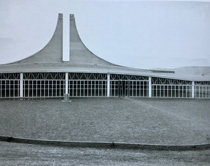 In the immediate vicinity of the Monument was the so-called Heroes Acre for those politically deserving and deceased personalities whom included the Chiefs in the Ciskei. 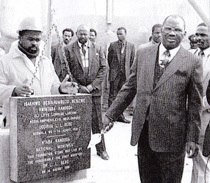 The memorial was also used as a meeting place during the term of President Lennox Leslie Sebe, who was represented here by a life-size statue. On 2011 02 26 an event was held by the administration of the Amathole District Municipality to cleanse the monument as testimony to the country's history and thereafter include it in the Amathole Heritage Initiative program.